LILY DE MAI is a new-to-me brand that I discovered recently, and I can confidently say, that it’s one of my best brand discoveries of the year! LILY DE MAI currently has eight skincare and body care products in its collection. I’ve tried three of the eight so far (the BLISS NMF Transformative Moisture Mist, HARMONY Omega 3|6 Recovery Serum, and PURITY Marine | Mineral Detox Mask) and have been very impressed! LILY DE MAI’s line centers around sensitive skin and the founder, Sara Runser, spent years researching the structure and function of the skin. She found that a strong, solid skin barrier is the foundation of healthy skin. For more background, the skin barrier is located in the top layer of your skin and is comprised of Natural Moisturizing Factors (NMF) and skin oils that form a water-resistant and antibacterial “super shield.” When the skin barrier is weak or depleted, irritants and bacteria penetrate the skin. This leads to moisture loss, and dry, red, itchy, inflamed skin. LILY DE MAI’s formulations include skin-supporting and soothing ingredients to replenish and strengthen the skin barrier, so your skin will be calm, hydrated, and glowy. While I don’t have super-sensitive skin all the time, I like the fact that I can turn to their products when my skin is being reactive, and my skin will be calmer and soothed in no time. The Mask is very potent. LILY DE MAI recommends that you leave it on for five to seven minutes and then wash it off with lukewarm water. I usually like to leave masks on for up to an hour — especially with clay masks for more detoxifying action. Well, the first time I used the mask, I left it on for close to an hour, and it did quite the opposite of calming and soothing my skin. My skin was super-inflamed and reactive and it took a couple of days to go back to normal. (No fault on their part — this was all user error!) I’ve found that my threshold is about twenty minutes just as the mask starts to harden. Don’t be like me and leave it on for an hour — definitely start off with the recommended five to seven minutes and then go from there. The Mask can get messy, and the marine scent lingers, so I would recommend that you to use the Mask right before you take a shower so that you can thoroughly wash everything off there. I really like the PURITY Mask as I feel that it does what it says it does. I like that the Mask is still kind of wet when you wash it off because you still get the detoxifying benefits without your skin getting uncomfortably tight. After I use the Mask, my skin does seem calmer, smoother, and “purified.” I also notice that my oil production is kept at bay, my pores are minimized, and circulation has increased. When my skin is feeling extra sensitive or dry, I like to add a few drops of the HARMONY Omega 3|6 Recovery Serum for extra moisturizing and soothing. As I mentioned above, I’m really impressed with LILY DE MAI. I think the Purity Mask is really effective and since it’s a powder mask and highly potent (using it two to three times a week would suffice), it should last you a while. I’m looking forward to trying some of their other products in the near future! 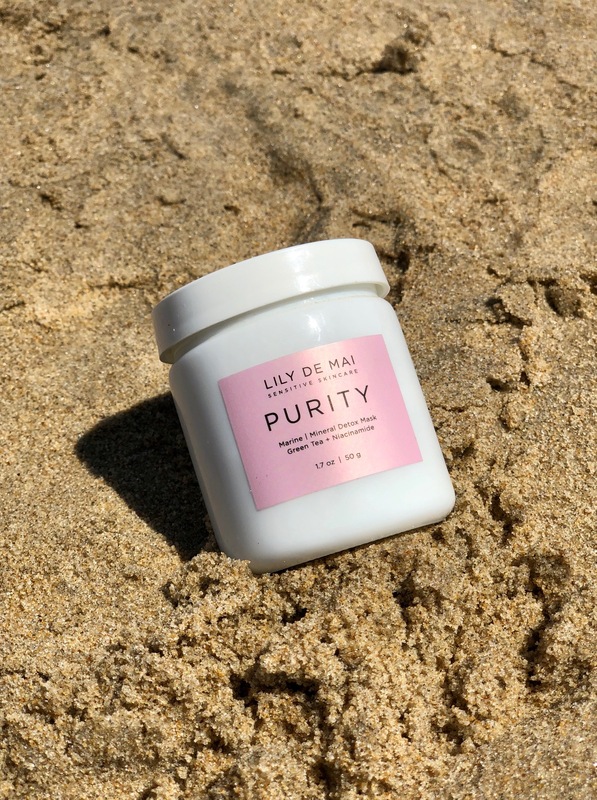 The PURITY Marine | Mineral Detox Mask (1.7 oz / 50 g) retails for $65 USD and can be purchased directly from LILY DE MAI. The LILY DE MAI PURITY Marine | Mineral Detox Mask was kindly provided for consideration, however all opinions expressed are my own. This post contains no affiliate links or codes. Thank you so much for your informative and thoughtful review. Yes, PURITY is most effective when it is kept damp on the skin and not allowed to dry out. We find that patting it on is the best way to apply. Many thanks for sharing Lily De Mai with your audience! It is my pleasure! Thank you for sharing PURITY with me!